The Elettromedia staff once again achieved success by investing ambition and passion into a new project which opens the mind to the future of mobile audio reproduction: the Audison Full DA technology, Full Digital Audio. Elettromedia displayed, for the first time, a demo car featuring Full DA technology; a VW GTI VI built by Mobile Solutions in Calgary Alberta Canada. This vehicle offered attendees the ability to “listen to the difference” between a traditional system vs. an Full DA system working entirely in the digital domain. The system featured a Mac Mini with coaxial digital output controlled by a 7’’ touch screen; then a special Demo-lab version of the Audison bit Onemanaging the 24bit/96kHzdigital audio signal; and finally on to an Audison AV 5.1kamplifier, belonging to the new Audison Voce amplifier line, a world wide premiere at CES. Thanks to the Full DA technology it was possible to reproduce HD liquid music (high definition liquid music) tracks, emphasizing the accuracy and musicality of the system, brought to life by the Audison Voce speakers; three-way front speakers + subwoofer. Among the new Audison products, there were also the two new processors debuted, expanding the bit line: bit Tenand bit Ten D, the latter being able to manage digital input and output signals in combination with any of the Audison Voce amplifiers; AV uno, AV due, AV quattro or AV 5.1k. A MINI Cooper Clubman, built by Sound Innovations in Hayward California USA highlighted the Hertzbrand; the HDP 5amplifier and the extraordinary new Mille line, both presented for the first time to the enthusiastic audience. With HDP amplifiers, Hertzmakes its debut in “ full-range switching” amplifier technology, merging high power with extremely compact size. As to the new Mille line, it is technological evolution; the result of the knowledge acquired by the Hertz R&D team throughout years of product development and exciting new product launches. A popular and increasingly requested feature is highlighted in this vehicle; full integration of the Hertz audio system with the factory equipped source unit. High level channels from the radio are input into the new Bit Ten, where they are summed, de-equalized, time corrected and acoustically tuned, before low level channels are passed to the amplifier. 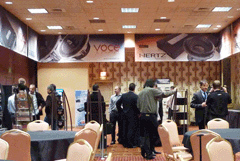 Also from the Hertz brand, the super compact EBX F20and EBX F25subwoofers were displayed. The highlights of these high performance systems include an incredibly flat profile, 108 and 119 mm respectively. Along with their proprietary passive radiators, these systems provide reference performance with simple, compact and versatile in-car installations.